Real Madrid brought the 3 points back to the Spanish capital this Saturday night, after visiting Malaga and beating the home side by 0-1. Cristiano Ronaldo decided the game in Real Madrid's favor, after scoring a beautiful goal around the 23rd minute of the first half. Next weekend, all eyes will be set at the Bernabéu, for the first Real Madrid vs Barcelona "Clasico" of 2014. With next weekend's Clasico already in everyone's mind, Carlo Ancelotti was keen to alert his players for the dangers of losing focus and dropping points in tonight's visit to Malaga. Fortunately, the Merengues seem to have listened well to their manager's words and managed to come out of Andalusia with the 3 points in the bag. The decisive goal was unsurprisingly scored by Cristiano Ronaldo, who broke the deadlock after a great strike with his right-foot when we were still half way in the first half. 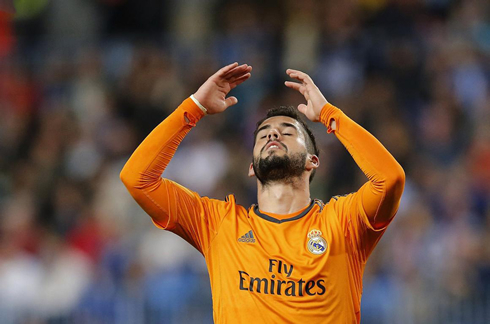 Real Madrid then held back Malaga's intents for the remaining of the match, thanks to a solid defensive performance that earned them another clean sheet. Next Sunday we all witness a thrilling Real Madrid vs Barcelona live clash at the Santiago Bernabéu, with the certainty that all pressure will be on Lionel Messi and his teammates. In the meanwhile, there will be another big match taking place in England, with a Manchester United vs Liverpool drawing everone's attention this Sunday afternoon. It's natural to expect that even a big team such as Real Madrid can't win comfortably in every league fixture they have. Tonight's game in "La Rosaleda" showed us that Carlo Ancelotti's men are well prepared to slow down their attacking pace when required and basically rely on their defensive fortress to hold on to a narrow lead. The Merengues stepped in to face Malaga presenting a couple rotations made by Ancelotti, with Varane taking Sergio Ramos spot due to his yellow-card suspension, and Isco coming on for Angel Di María, since the Argentina international was in risk of being ruled out for the next week's Clasico against Barça, had he seen a yellow card during the game. However, it turned out that Ancelotti felt forced to bring on Angel Di María sooner than we would have wanted, after a very unlucky play occurred in the first half and where Cristiano Ronaldo and Karim Benzema basically bumped into each other when going after the same ball. The France international seems to have knocked with his knee against Ronaldo's leg, which forced him to step out of the game injured, roughly 15 minutes before half-time. The Real Madrid striker is now in doubt for the next days' fixtures against Schalke 04 (in the UEFA Champions League round-of-16 return leg) and Barcelona for La Liga (on March 23). 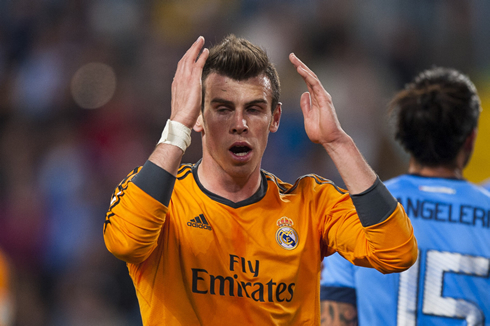 The only goal in the game was scored inside the 23rd minute of the first half, when Gareth Bale decided to release a long pass to Cristiano Ronaldo on the left attacking side. The 29-year old forward was then able to take on a couple defenders as he cut inside, just until he found enough room to curl the ball into the far post with his right foot. 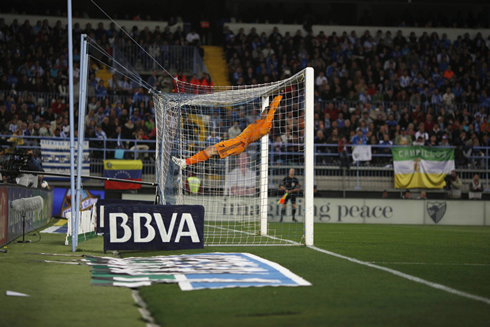 Malaga's goalkeeper had very little he could there and Real Madrid had just earned a precious lead. A few minutes later, Benzema would pick up an injury and leave the pitch... That unfortunate event allowed us to see that the Merengues backup plan for replacing the Frenchman didn't exactly work as it should have (attacking-wise), despite another good display from the men at the back. With tonight's win, Real Madrid assured that they will at least maintain a comfotable point-gap to their biggest rivals Atletico Madrid and Barcelona, which is currently set at 3 and 4 points respectively (that is, if they both win their fixtures this weekend as well). 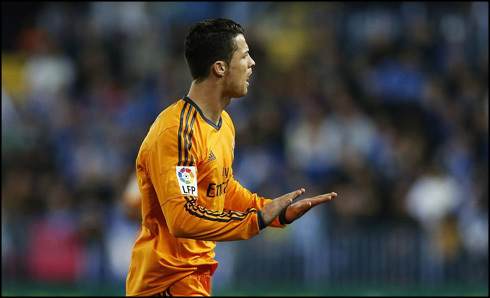 As for Cristiano Ronaldo, the Portuguese star scored his 25th goal in La Liga and remains the competition's top scorer. This Tuesday, he'll try to increase his goalscoring record in the UEFA Champions League (11 goals), as Real Madrid will host Schalke 04 in their round-of-16 return leg, after having already won 1-6 in the first leg played in Germany. 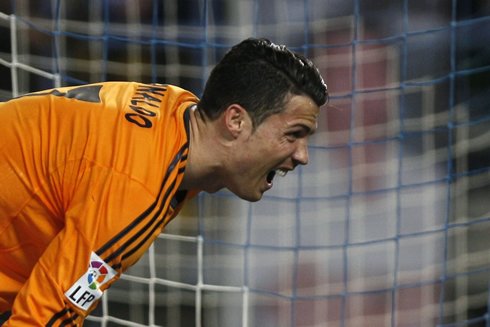 Cristiano Ronaldo next game for Real Madrid will be against Schalke for the UEFA Champions League, on March 18 of 2014. You can watch Juventus live stream, Real Madrid vs Schalke, Barcelona vs Osasuna, Manchester United vs Liverpool and Tottenham vs Arsenal, all games provided from our soccer live section.